With one of the most stunning views in East Anglia, River Cottage offers you a special location for a self-catering holiday in Suffolk. Completed in 2016, and over looking the Alde estuary at Iken Cliff, River Cottage can sleep four people in stylish and contemporary comfort. It is one mile downstream of the famous Snape Maltings concert hall, home of the Aldeburgh Festival, and a few miles upstream of the delightful seaside town of Aldeburgh. The cottage looks over the estuary as it winds its way in from the Suffolk coast, past historic Iken church and on up to Snape bridge. Bird life is in abundance including avocet and other waders, while seals and (sometimes!) otters can be seen from the bank. Bird watching at the RSPB's reserve at Minsmere is also just a short drive away, as is the village of Orford and town of Framlingham with their respective ancient castles. Thorpeness, Aldeburgh and Woodbridge are within easy reach and just up the coast is Southwold, with its pier, as well as the beautiful villages of Walberswick and Dunwich. 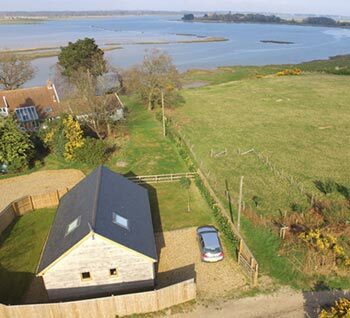 In an Area of Outstanding Natural Beauty, River Cottage provides the ideal location for a self-catering holiday from which to discover this beautiful part of the Suffolk coast. Entrance hall: For hanging coats and storing boots etc. Private garden: Parking for two cars, lawn area, garden furniture and an amazing view!